Although little known outside Brazil, this country was during the Second World War the main U.S. ally in Latin America. At that time many Brazilian ships were sunk in the conflict, causing the declaration of war against Germany and Italy on August 22, 1942. But even before this date, naval forces U.S. maintained a network of air bases in the major coastal cities of Brazil. 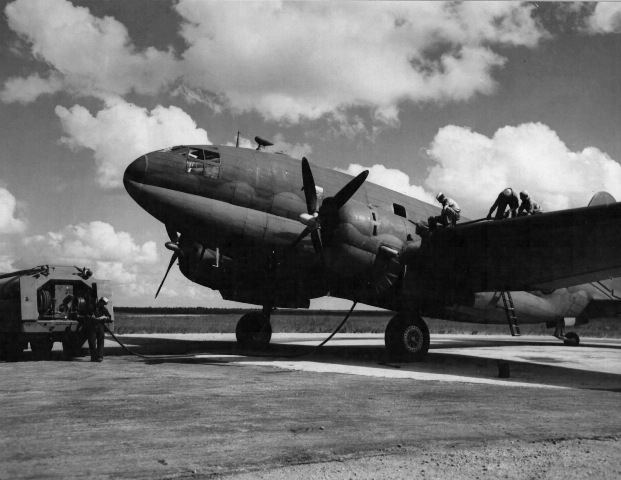 For the U.S. bases in the cities of Belém and Natal were of vital importance to the call of the South Atlantic route, they passed thousands of aircraft to the south of Europe, Africa, Middle East, India, China, Burma and elsewhere. 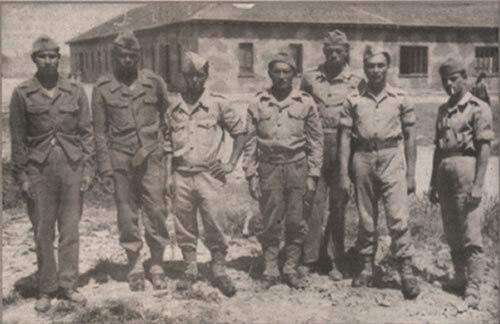 From December 1941 until the end of the conflict, the city of Natal, located in the Brazilian Northeast, received a large number of American soldiers who operated the wide Parnamirim Air Base, besides their patrol squads and hunting and destruction Nazi and Fascist submarines. The U.S. military authorities worked together with the authorities and the Brazilian military that even with serious deficiencies in equipment and training, did their best to protect their territory. Among the orders for the thousands of Brazilian soldiers assigned to this mission, is the exercise of strong vigilance on the coast. This task was assigned to the 7th Military Region, then a control region (now extinct) of the Brazilian Army, with headquarters in the city of Recife. The Brazilian Air Force and the Navy of Brazil also participated in these efforts, but in other ways. 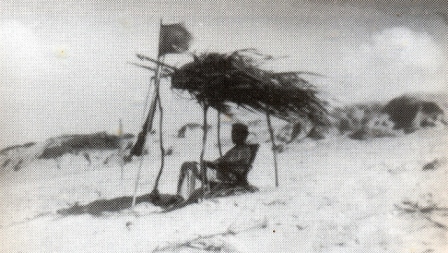 Army units were moved to the northeastern beaches. Men from various parts of the country occupied the coast, in a form of defense somewhat questionable in the sense of war. Actually they were more observant of things happening on our beaches, which itself was a fighting force able to deter a possible invasion. But they were important in its function and this activity had its value. I believe that the Brazilian military brass pointed to other goals. How to prevent the landing of spies by submarine and the very question of the psychological context of transmitting to the population of these coastal regions that our forces were present on our shores, taking part of our defense. Despite this importance, we know that given the revealing of the history of Brazilian participation in World War II, by quite a few studies that linked the memories of the Brazilians who were at the European front. If the state of history connected people who crossed the ocean to fight in Italy is limited, the more difficult are the testimonies of those who were patrolling our beaches, awaiting the arrival of an enemy that could land at any time. The lives of these soldiers of the Brazilian army was not easy. Besides having to endure the jokes of people who said they were on the beach “sunbathing” there was the scarcity of accommodation, food, the uncertainty of the appearance of the enemy, the monotony of deserted beaches, the wear caused mainly by the mighty Northeastern sun, salt, sand, wind, rain fell from time to time and homesickness, especially for those who had come from afar. Indeed the situation was monotonous. But not always! Years ago I met the Mr. Clóvis Ramalho Ribeiro Dantas, a Brazilian born in Natal, father of our great friend, the economist Vivianne Fernandes Ribeiro Dantas, she is a competent official of the Regional Labor Court of Natal. Mr. Clóvis, was the retired bank cashier. Serious man, worker, mason, quiet and liked to tell stories of his participated in the Second World War. He recounted his sufferings always one of the “beach soldier” as the coast guard was known. He spoke about the patrols, the lack of what to do, spending all day staring at the sea of ​​night patrols and day to day of this function. But one day something appeared on the horizon and everything was different and busy. You said that Mr. Clóvis said that “beginning of the year 43, probably in January.” He was on patrol in the area of ​​Ponta Negra Beach, in the area near the present highway known as the “Via Costeira”, a desert location at the time, but currently is full of sumptuous hotels that receive thousands of tourists who visit the city of Natal. According to him, his friend, a military, who was the first person to spot the small boat. For this military, which drew his attention to the sea were some sea birds flying over a point in the sea and then he noticed the small boat. Then someone, or the strength of the tide, brought the boat to shore. Several Brazilians were watching what was in it. Your Mr. Clóvis was among these patrols. What caught his attention, even when he was walking some distance from the ferry, was the smell of rotting flesh. Inside the lifeboat was the reason: there was a human body in a state of putrefaction. He was a man, of the North American military, with clothes of a foreign exchange official U.S. Army. The body was very dehydrated, badly burned, with multiple wounds in the skin caused by the sun and birds. The head was hanging on the edge of the raft, and what most caught the attention of Mr. Clóvis, was the lips late opening of grotesque form, showing what was due to the action of the sun. At the time when he recounted this episode, he told me that it may be endured, but many colleagues vomit before the board. Like most of the Brazilian population is devout Catholic, to these other military men, who made the sign of the cross and remained on their knees and prayed for the souls of the dead. It is war that, but even without going directly to Natal, he sent a message there saying. Another thing that caught the attention of this young Brazilian soldier was a small bag that from the U.S. A Brazilian sergeant opened to verify its contents and found, according to Mr. Clóvis, several “small plates with engraved names”. He was speaking of the famous identification nameplates, involved in several armies during the Second World War. Used primarily to identify the wearer in case of death or injury, the small plates served as a source of medical information for treatment, always bringing the blood type and other data. The Americans called this material “Dog Tag” because of its similarity with the plates placed in collars, used to identify dogs. Soon they reached the shore where were U.S. military, both soldiers and officers. 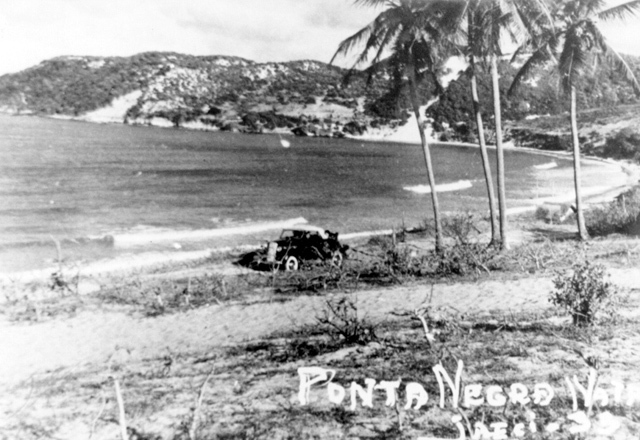 Some of the men rolled the body, which when searched, photographed it, took notes, and sought information from the Brazilian patrol through interpreters. Everything was done quickly, without much talk, no crying, with the military quiet and reserved. Soon the U.S. military took the corpse, the bag with small plates, the ferry, put everything into a vehicle and drove away. Mr. Clóvis Ramalho Ribeiro Dantas never forgot this day. But until his death in 2008, her never knew who was the American on the ferry. Mr. Clóvis thought the occupant of the boat was the victim of a submarine that sank a ship in the Atlantic and Mr. Clóvis never knew his name. I’ve never forgotten the story that Mr. Clóvis told me with, to the richness of detail and eloquence as he recounted this episode. But at the same time, due to lack of information provided to the Brazilians at the time, about who the person was on the ferry, there were few details known about the case. 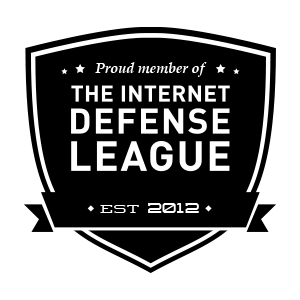 Recently I remembered the story of Mr. Clóvis and his like today we have this unique tool (both for good and for bad) that we call the internet, I had the desire to seek contacts with people around the world, seeking any information on this episode. I left information about the case and to my luck and surprise, Mr. Henry F. Mann, Sydney, Australia, sent me a helpful message, which forwarded the pictures of two pages of old newspapers in his country. The newspapers were of January 1943 and had an interesting story about a plane crash in the middle of the Atlantic Ocean. 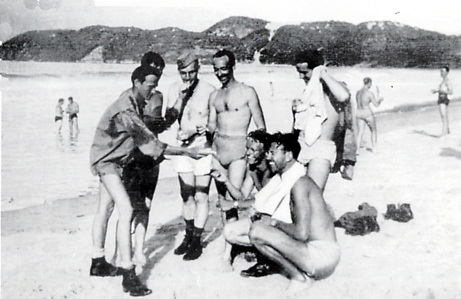 In a note from the Australian newspaper “The Mail”, Adelaide city, edition of February 20, 1943, on the first page, reports that a small life raft, rubber, bearing the body of Maj. Arthur Mills, member of the Army Air Corps Ferry Command, who drifted to a beach near Natal, Brazil. Pointed to note that Major Mills struggled to survive because the small boat had fish bones and one of those traditional emblems of an eagle (which the Americans put on the caps of officers during World War II) was transformed into a makeshift fishhook. More significant was the fact he was found with the body together with six aboard “Dog Tag”, indicating that six other airmen had died, probably on the ferry, amid a tremendous agony of thirst and hunger. The names of these six victims were not released. It was a very similar story that was told to me by Mr. Clóvis. Since the newspaper “The Sydney Morning Herald”, issue on 24 January 1943, on the eighth page, you find the news that follows. 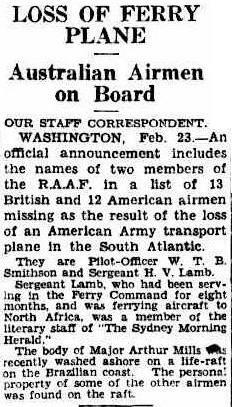 Two members of the Royal Australian Air Force (RAAF), the pilot W. T. B. Smithson and Sargent H. V. Lamb, along with thirteen Americans and twelve British who were unaccounted for due to the loss of an American transport plane in the South Atlantic. The note stated that the body of Major Arthur Mills had been taken on a life raft headed for the Brazilian coast. The note ended, that some of the personal property of other airmen were found in the raft. Then I remembered that in the city of Recife, a friend of mine has a copy of the book “The eagle in the egg” and might have some information about this case. Written in 1949 by Lt. Col. Oliver La Farge, and published by Houghton Biffin Company, Boston, this material with 319 pages detailing the history of the ATC – Air Transport Command, which was the agency that developed the network of aircraft, airports, airfields and the whole structure of American air travel in the Second World War. 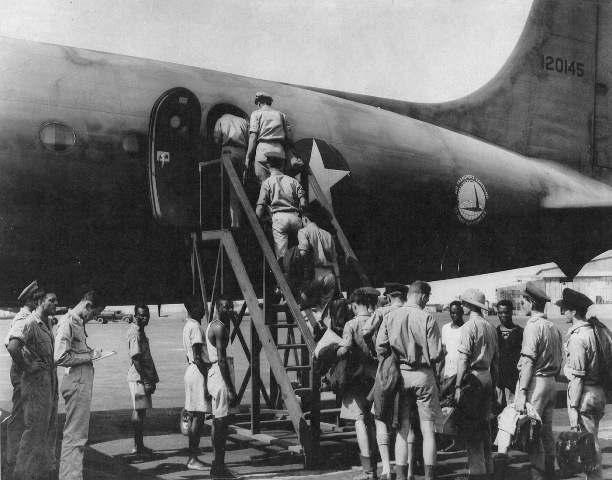 At my request he did a search and found on page 194, that just before midnight on January 17, 1943, a transport aircraft model Consolidated C-87 “Liberator Express”, registration number 41-1708, took off from the African city of Accra, the former Gold Coast, now Ghana, towards the city of Natal. Its pilot was Captain Orval Eknes Mijkpen and he basically carried passengers. Given in the book that due to a good strong tailwind, Capt. Elwes planned to make the trip nonstop, just flying over the island of Ascension, a volcanic rock in the middle of the Atlantic Ocean, belonging to England and also an important air base support. But this plane just disappeared. At noon on Jan. 18, began the search for the aircraft along the route which, although hampered by bad weather conditions, was continually used until January 30, 1943, both by air, for seeking military signals brought on Brazilian beaches of the sea. 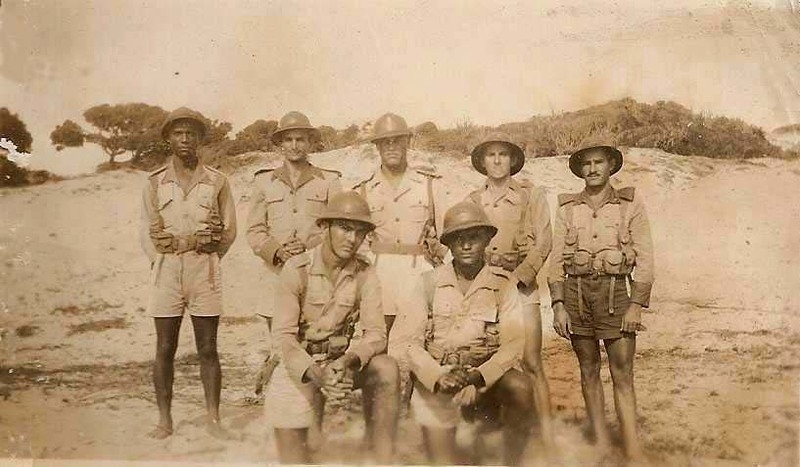 On February 5, a Friday, the Brazilian soldiers patrol in Ponta Negra, among them the Mr. Clóvis Ramalho Ribeiro Dantas, spotted a lifeboat where the dehydrated body of Major Arthur Mills. 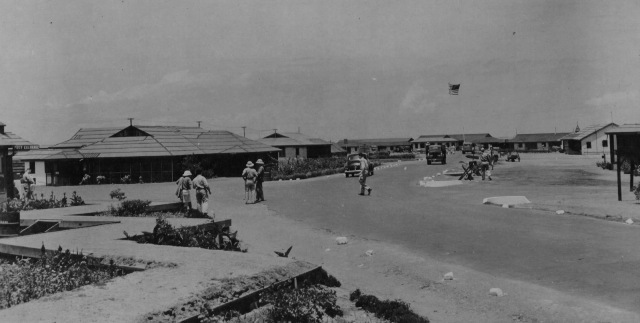 This was nineteen days after the plane C-87 41-1708 had taken off at night in Accra. This appeared in “The eagle in the egg,” the men who perished on the waters of the Atlantic, left no records or documents to unravel the mystery of the disappearance of C-87. What was interesting is that the author has confirmed the note’s Australian newspaper, that there were bones and a distinctive cap of colonel to form a fishhook. 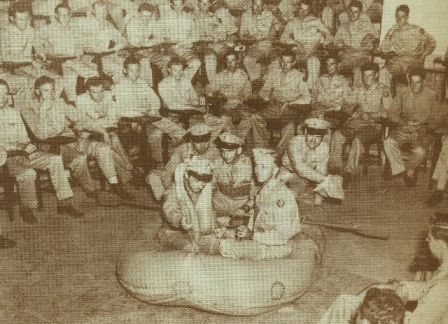 For Lt. Col. La Farge, it was evident that the plane had landed successfully in the water and the men on board (or part of them) should have successfully managed to evacuate the stricken aircraft, but with great haste, but apparently did not bring all of their survival gear in the raft. The ensuing investigation found that Captain Elwes was one of the best pilots to fly over Africa, he was not tired, had not drunk the night before the match in Accra. The records show that the behavior of the entire crew before the flight was normal. There was the usual inspection before takeoff and the engines were in great condition. The book claims that the plane was relatively new in service, without having flown in an excessive way. Furthermore there was no unusual incident, nor was any message received from the plane after it took off. 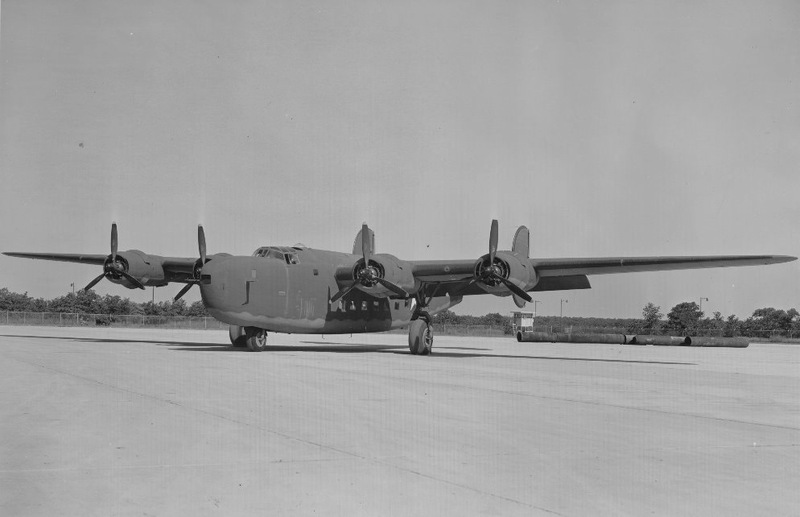 For the book’s author, Lieutenant Colonel La Farge, a likely explanation was that this accident could have been any problem with the fuel on board or the C-87 could have been knocked down by a German submarine. These are just theories. The truth about what really happened to the C-87 “Liberator Express” will probably never be known. Major Arthur Mills who was a former transport pilot of air mail in the United States, was born in the city of Muscatine, Iowa. Among the occupants of the aircraft was Sgt Ross Ballard Moore Jr., of Texas. He graduated in 1940 and joined the Army Air Corps of the United States and died in this accident. It was the only crew member who was photographed and there is a strange story involving this military. Sergeant Ross Ballard Moore Jr.
On the internet site http://www.findagrave.com/cgi-bin/fg.cgi?page=gr&GRid=42650429 amid a series of misrepresentations regarding this accident, a relative says that on the night of 15 January 1943, the older sister of Ballard, called Dorothy Lee, the awoke, and saw at the foot of her bed she saw her brother. She was surprised and startled, because she knew that he was in South America. What was worse when she heard the figure clearly say “You’ll have to take care of our mother now, I will not be able”. Reportedly, she began to ask what he was talking about but he was gone. According to the information on this site, the family only learned of the accident two days late. I am not judging this last information, just informing. Rostand Medeiros – Was born in Natal, Rio Grande do Norte. He is a 45 years old writer, researcher and expert in producing biographical works. Also does researches in history of aviation, participation of Brazil in World War II and in regionalist aspects of Northeast Brazil. 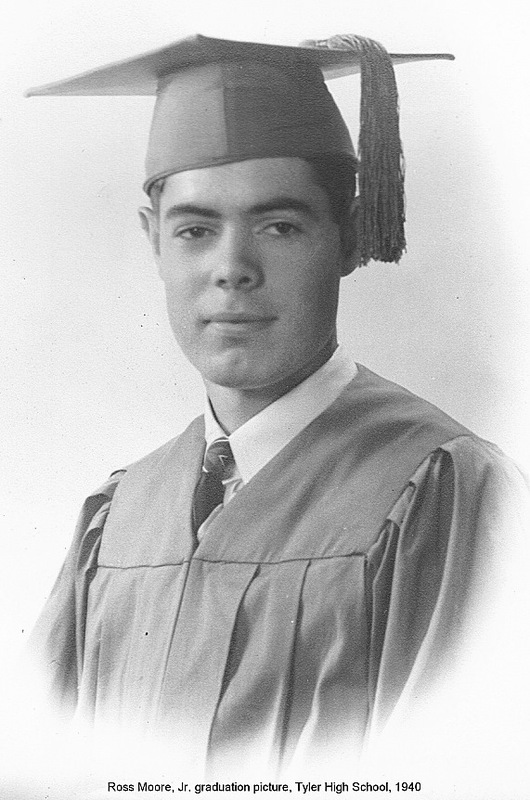 He studied History at UFRN – Federal University of Rio Grande do Norte and is member of Genealogy Institute of Rio Grande do Norte – IGRN and SBEC – Brazilian Society for the Study of Cangaço. In 2011, Rostand Medeiros launched the book “João Rufino – Um Visionário de Fé” (“João Rufino – A visionary of Faith”), a biography of the founder of industrial group Santa Clara / 3 Corações, a large coffee roasting company in Latin America. The book shows how a simple man, with a lot of hard work, was able to develop, in Rio Grande do Norte state, a large industry that currently has seven units and 6,000 employees in Brazil. Also in 2011, he wrote, with other authors, a book of short stories entitled “Travessa da Alfândega” (in free translation, “Customs Cross Street”). He also published articles in “Tribuna do Norte”, newspaper of the city of Natal, and in “Preá”, cultural magazine published by Rio Grande do Norte State Government. He founded SEPARN – Society for Research and Environmental, Historical and Cultural Development of Rio Grande do Norte. Currently, is working as a Parliamentary Assistant in Rio Grande do Norte Legislative Assembly and develops other books. Rostand Medeiros is married, has a nine years old daughter and lives in Natal, Rio Grande do Norte, Brazil. Este reportaje is magnífico y sumamente interesante. Te ofrezco mi ayuda con cualqier otros detalles, especialmente los que se refieren a la guerra en espacios aereos sobre Europa en 1944/45. Bueno, este espacio es para democratizar la información histórica, sobre todo acerca de mi región. Realizamos ahora el cambio en la parte visual de este blog. Espero que disfruten el contenido. Gracias por su atención y su deseo de ayudar a nuestro trabajo voluntario. Pingback: U.S. national team and WWII in Natal | to Durban and back, World Cup 2010 and on to Brazil in 2014!